January 2015 – Concurrent Technologies announces VP B1x/msd, a 6U VME board based on a 4th generation Intel® Core™ i7/i5 processor. The headline variant of VP B1x/msd uses the quad-core i7-4700EQ processor that features new instructions to enhance vector processing and security along with improved graphics capability. Variants are also offered based on i5-4410E and i5-4422E processors for dual core based performance and power optimised solutions. All processor variants include Intel HD Graphics 4600 which has 20 execution units and can support three simultaneous display outputs. A front or rear VGA port is provided for backwards compatibility with previous boards. Up to two DVI-D interfaces and a DisplayPort connection are available as options for applications needing high resolution digital display support. A 2.5-inch drive can be accommodated on-board for mass storage and Concurrent Technologies offers a range of hard and solid state disks. Other solid state storage options include a CFast slot and a Flash disk module site to provide a choice for reliable program and data storage. One or two XMC/PMC sites are available, depending on variant purchased, for local I/O expansion. Other enhancements include USB3 connectivity for high speed interfacing and setup operations. To aid integration, Concurrent Technologies develops and supports board support packages in-house for popular embedded operating systems including Windows®, Linux® and VxWorks®. A number of optional tools and utility packages are available to enhance the product for critical embedded applications. The standard BIOS can be replaced with a customer configurable Fast Boot package to provide improved boot times. A comprehensive Built-in Test (BIT) package and board level security package are also available, the latter providing features designed to prevent access to sensitive data. “We have continued to develop a wide portfolio of products based on the latest generation Intel® Core™ processor family for demanding applications. 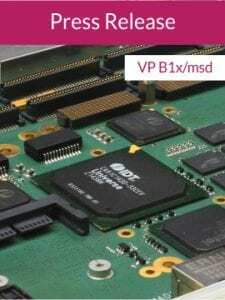 VP B1x/msd is another proof point demonstrating our commitment to provide our customers with a range of open standards boards based on the latest technology from Intel. VMEbus has been a very stable architecture and we are continuing to support our existing customers with dependable products that they can deploy in a range of environmental conditions”. First customer shipments of air cooled VP B1x/msd boards are scheduled for Q1 2015 with rugged conduction cooled variants expected later in 2015. All companies and product names are trademarks of their respective organizations. Intel, and Intel Core are trademarks of Intel Corporation in the United States and other countries.